Manuel Than's research group focussed on Alzheimer's Disease (AD) and the large type I transmembrane protein β-amyloid precursor protein (APP). Furthermore, PC-Inhibitors were studied and the lab extended or adapted new protein-crystallographic methods. Alzheimer's Disease (AD) is the most frequent dementia worldwide, occurring predominantly in the elderly population. The disease-typical senile plaques contain as the main component the neurotoxic amyloid β-peptide (Aβ), which is proteolytically derived from the large type I transmembrane protein β-amyloid precursor protein (APP). One key step is the cleavage of an intermediate inside the membrane by the large proteinase complex γ-secretase, finally liberating Aβ. 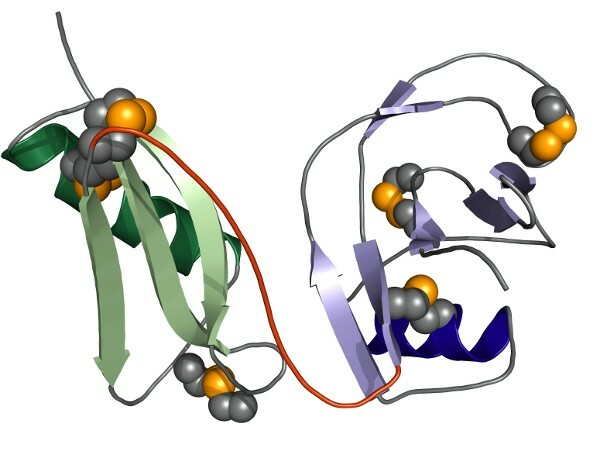 While the overall processes leading to the formation of Aβ have been elucidated in many labs over the last years at the cell-biological and biochemical level, rather little is known about the detailed atomic structures of many involved molecules, their interactions and physiologic functions, setting the starting point for many research projects in our group. Overall structure of the membrane-bound APP protein. For more details see Coburger et al (2013) PLoS One, 8, e81926. The ectodomain of the type-one transmembrane protein APP consists of tightly folded and of flexible sections as expected for a typical multi-domain protein. Our biochemical and biophysical analyses of its overall architecture experimentally showed the existence and the exact boundaries of the two domains of defined secondary structure, called E1 and E2. They are linked to one another and to the single transmembrane helix of APP by truly flexible segments. E1 and E2 are connected by a sequence stretch that predominantly contains acidic amino acid residues, also called the acidic domain (AcD). In-between the AcD and E1, an additional region of conservation and partial flexibility, the extension domain (ED), is found in vertebrate APP. The flexible juxtamembrane region (JMR) connects E2 to the single transmembrane helix of APP. It contains the α- and β-secretase cleavage sites whereas the γ-secretase cleaves within the TM-helix. APP forms an extended molecule that is flexibly tethered to the membrane with no distinct interaction of its constituting domains and segments. On the next level of organization and interaction, APP is probably subject to a number of oligomerization events and additional protein-protein-interactions, which build on the here shown three-dimensional structure of the isolated, monomeric protein. Dimerization of APP is widely believed to be central to its physiologic function and to its processing in AD, influencing e.g., the Aβ-generation, the APP-ECM and the APP-based cell-cell interaction or being important for receptor activities in general. We have investigated by biochemical and biophysical methods, which parts of APP interact with high affinity (low KD) also at low protein concentrations and which contacts correspond to low affinity and hence seem to result from other interactions that energetically must occur beforehand. Dimerization of APP is primarily mediated by E1 and results in the formation of cis- and trans- dimers. For more details see Hoefgen et al (2014) J Struct Biol, 187, 30-37. We found that both E1 and E2 are able to form weak dimeric contacts, but only E1 can interact with short heparin chains in a way that pre-existing protein-protein-contacts get stabilized. Thus, the dimerization of APP is energetically induced by a heparin mediated dimerization of its E1 domain, which results in a dimeric interaction of E2 and probably also the transmembrane region (TM), depending on the cellular location of APP. Thus, APP can exist as both, cis-dimers that form if the two APP-molecules originate from the same membrane, and trans-dimers that result from the heparin-induced interaction of two E1-domains belonging to APP-molecules originating from opposite membranes. Crystal structure of the entire E1-domain of APP. For more details see Dahms et al (2010) Proc Natl Acad Sci, 107, 5381-5386. Our crystal structure of the entire E1-domain of APP shows that the two constituting subdomains called growth factor like domain (GFLD) and copper binding domain (CuBD) form one rigid structural and hence functional entity. At slightly acidic (vesicular) pH the two subdomains are tightly connected. Interestingly, this interaction shows some plasticity at neutral to slightly basic (extracellular) pH, suggesting that this interaction might depend on the cellular localization of APP. As shown biochemically as well as seen in the crystal, two such E1-units form a tight dimer. 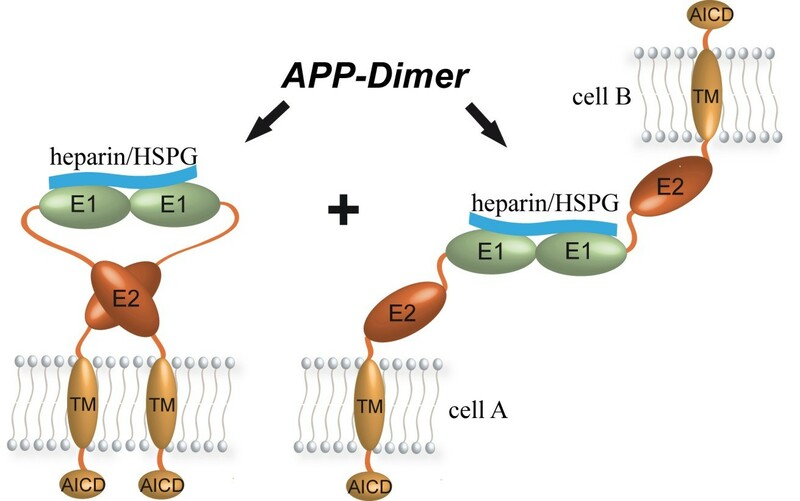 This E1-based dimerization of APP is induced and stabilized by the interaction with heparin, probably mimicking the physiologically more abundant heparan sufate proteglycanes (HSPGs). The pH-dependancy of the interaction between GFLD and CuBD has recently been studied by us in more detail, showing that specific hydrogen bonds between Asp177 and Glu87 as well as between Asn89 and His147 are major determinants of this pH-driven conformational switch in APP-E1. Our biochemical and crystallographic data on the E2-domain of APP identified a metal-dependent molecular switch located within this part of APP. 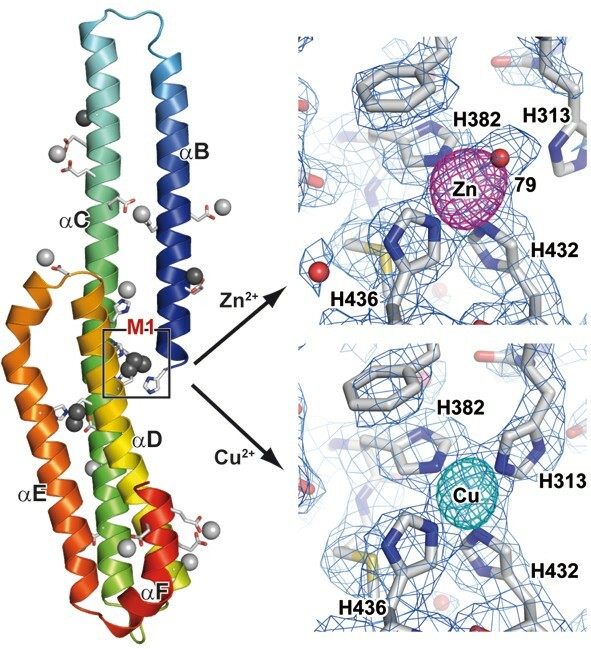 Four evolutionary highly conserved histidine residues bind specifically and with high affinity to copper and zinc at physiological concentrations. Metal specific coordination spheres induce large conformational changes and enforce distinct structural states, most likely regulating the physiological function of APP and its processing in AD. We could show in subsequent mutational experiments that were guided by these structural studies, that His313 is dispensable for the binding of Zn2+, whereas His382 is essential for the ligation of both metal ions. Thus the mutation of His313 to alanine only affects the binding of Cu2+ to the M1-site whereas the mutation of His382 to alanine abrogates any metal-ion/M1-dependent effect on E2. Crystal structure of the metal-bound E2-domain of APP. For more details see Dahms et al (2012) J Mol Biol, 416, 438-452. The respective effect on the interaction of APP is only seen for its binding of extracellular but not of intracellular partners of APP, consistent with a regulation of these interactions by the extracellular concentration of metal ions binding to M1. Crystal structure of the ligand binding region of death receptor six (DR6). For more details see Kuester et al (2011) J Mol Biol, 409, 189-201. We recently solved the crystal structure of the extracellular domain of the orphan death receptor six (DR6), as part of our investigations on the molecular interaction of APP with signalling partners and to understand how this interaction might lead to the development of AD. DR6 belongs to the tumor necrosis factor (TNF) receptor superfamily whose family members are intimately involved in the signal transduction pathways during apoptosis, stress response and cellular survival. It was shown to act as receptor for soluble, N-terminal APP-species resulting in axonal pruning and neuronal apoptosis. The cysteine-rich domain of DR6, the usual ligand binding region of TNFR-family members, shows the typical fold of this domain and exposes a DR6-specific surface responsible for the selective recognition of its ligands. Comparison of APP to known, typical ligands of TNFR-family members, however, shows an unprecedented symmetry and structure suggesting that its interaction with DR6 is different from prototype TNFR ligands. In eucaryotes, many secreted proteins and peptides are proteolytically excised from larger precursors by a specific class of serine proteases, the Proprotein/Prohormone Convertases (PCs). This cleavage is essential for the activation of the respective substrates, ranging from peptide hormones (such as insulin), extracellular proteases, growth and differentiation factors (implicated in neurodegenerative diseases, tumor growth and metastasis) to bacterial toxins and viral coat proteins, making the PCs a very interesting pharmacological target. Based on our crystal structure of furin and studies of other groups, we were beginning to understand how furin and more generally this class of unusually specific endoproteinases recognize and cleave their substrates. a number of highly specific hydrogen bonds and further contacts that focus especially on the P1 as well as the unusually interacting P4 and P5 side chains. Developed inhibitors show only limited side reactivity and show a large beneficial effect in different models of viral infection. Inhibitor MI-0052/I1 in complex with human furin. For more details see Dahms et al (2014) ACS Chem. Biol, 9, 1113-1118. 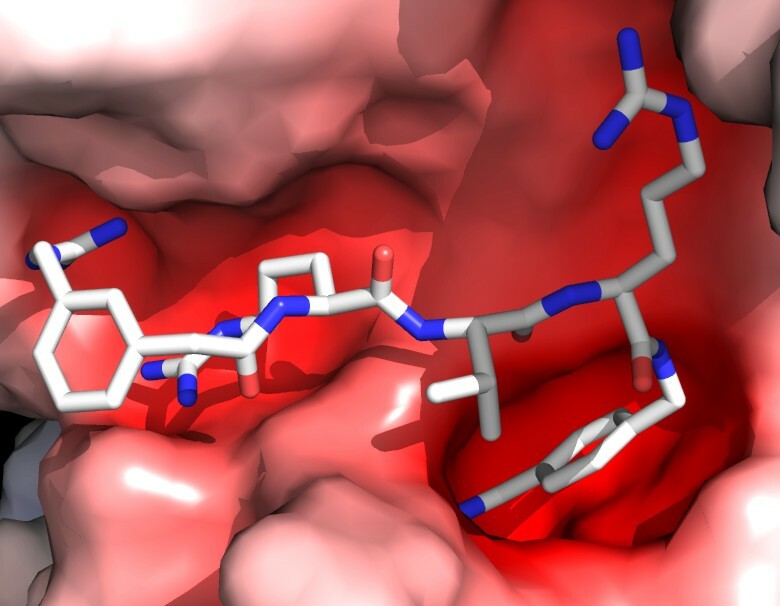 In future projects we want to extend our structural understanding, the rational structure-based development of inhibitors and their pharmaceutical application also to other members of the PC-family and to additional disease states. Our protein target oriented research often results in the necessity to establish, extend or to adapt new protein-crystallographic methods such as the development of an element-specific electron density map, calculated from anomalous differences collected at the K-absorption edge of calcium. This map unequivocally defined the exact number and spatial localization of Ca2+ ions bound to furin. Recently we employed this method to investigate specific metal binding sites in APP. During the determination of the crystal structure of DR6 we developed a novel approach for the experimental phase determination in protein crystallography employing heavy atom cluster compounds and their orientation by molecular replacement using either isomorphous or anomalous differences. In addition, we have used the transformation of protein crystals by tightly controlled humidity changes to improve the internal order of protein crystals, hereby enabling us to solve the respective structure. 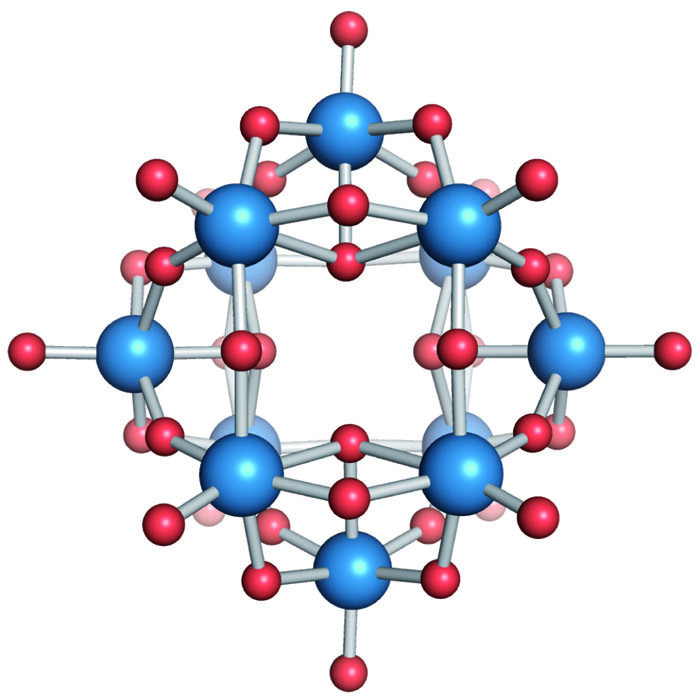 Structure of HMT used in cluster-MR. For more details see Dahms et al (2013) Acta Cryst D, 69, 284-297.